Paris has some decent hotels, some that are awful and a few that are majestic. Two of my favourites in the last category have just been given the French government’s ultimate accolade. [dropcap size=small]T[/dropcap]he Mandarin Oriental Paris and the Shangri-La Paris have both been granted ‘Palace status’ by Atout Paris, the French Agency for Tourism Development. The award was established in 2010 and was designed to “enhance the image of France throughout the world. ” Both the Mandarin and Shangri-La Paris opened to great fanfare just under four years ago and this is the first time they have been granted the award. 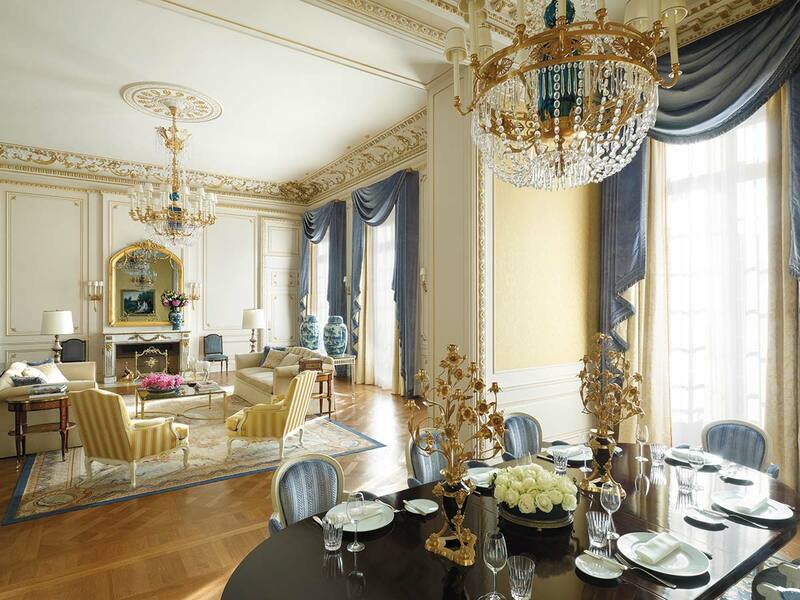 The “Palace” status has been given to just eight properties in Paris. Apart from the Mandarin and the Shangri-La, the other six are Le Bristol, Le Four Seasons Hotel George V, Le Meurice, Le Park Hyatt Paris Vendôme, Le Plaza Athénée and Royal Monceau – Raffles. The new Peninsula Paris, which opens its doors next month, is not yet on the list and may well have to wait at least four years to be included if the experience of the Mandarin and Shangri-La is any guide. Atout Paris gathers a weighty dossier on any property aspiring to Palace status and the judging process is notoriously tough. “We are truly thrilled to have received this prestigious accolade,” said Philippe Leboeuf, General Manager of Mandarin Oriental, Paris. “This is due to the hard work and dedication of our colleagues who aim to deliver daily the legendary service for which Mandarin Oriental is renowned. We will continue to focus on our mission which is to delight our guests, ensuring that their stay with us is a memorable one”. My stay at the Mandarin last year was truly memorable and I loved the Art Deco property with its award-winning Spa and two Michelin starred restaurants. The rooms are very chic and the entire hotel has an air of romance and intrigue that is only possible when a property sits on Rue Saint-Honoré and is the next-door neighbour of Place Vendôme. The Shangri-La has had the air of a palace from the moment it opened and during my stay at Christmas 2013 I was entranced by its beauty and gorgeous views of the Seine and Eiffel Tower. Although the hotel, in the former home of Prince Roland Bonaparte, is at one remove from the heart of Paris it has become a destination for the travelling elite. Despite the awards, the Mandarin or the Shangri-La are unlikely to rest on their laurels. With the Peninsula opening and the Ritz and Hôtel de Crillon coming back on stream next year the competition to become the best hotel in Paris can only become more intense.